WAIST HIGH: David Byrne's Bicycle Diaries Now Available On Audiobook. 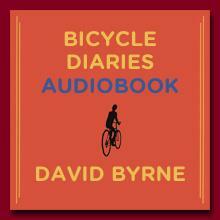 David Byrne's Bicycle Diaries Now Available On Audiobook. One year after the publication of his "behind-the-handlebars view of the world's cities," David Byrne has released Bicycle Diaries in a podcast-style audiobook which is now available exclusively at davidbyrne.com. In addition to narration by Byrne himself, the audiobook also features "location sounds, creating an atmosphere more akin to a radio show than a simple reading of the book. While the chapters are available for purchase individually - as the journal-style book can be read in any order - the complete unabridged book is also available for download at a discounted price," and the Introduction is available as a free download as well. From Powell's Books: Since the early 1980s, David Byrne has been riding a bike as his principal means of transportation in New York City. Two decades ago, he discovered folding bikes and started taking them on tour. Byrne's choice was made out of convenience rather than political motivation, but the more cities he saw from his bicycle, the more he became hooked on this mode of transport and the sense of liberation it provided. Convinced that urban biking opens one's eyes to the inner workings and rhythms of a city's geography and population, Byrne began keeping a journal of his observations and insights.